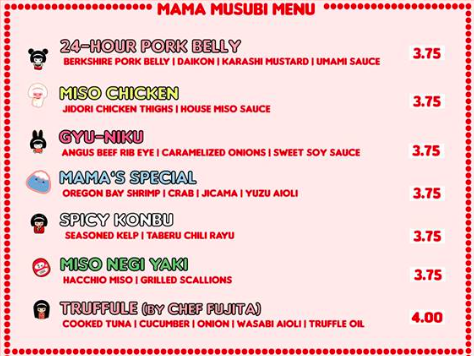 Aburiya Toranoko has partially given way to Mama Musubi, a rice ball stand that is usually at the Altadena Farmer’s Market. It’s not life-changing, but I definitely recommend stopping in for lunch this week for a great value lunch. Forget the cruddy, always disappointing onigiri you get at Marukai and Nijiya markets. These are freshly made with premium ingredients. I tried the pork belly onigiri and the Mama’s Special (shrimp, crab, and yuzu aioli). Delicious and fresh, with some shredded nori and furikake on the side of the rice. The amazing value is their lunch special. $9.50 gets you two onigiri (your choice), a side of kara-age, miso soup, a small salad, a dollop of potato salad, and some cabbage slaw. It’s a lot of food. And while the miso soup and potato salad are perfunctory, the rest of the food is pretty great. The salad and slaw are simple, but feature tasty dressings. The kara-age is moist and well-seasoned. And the rice balls are both very tasty. 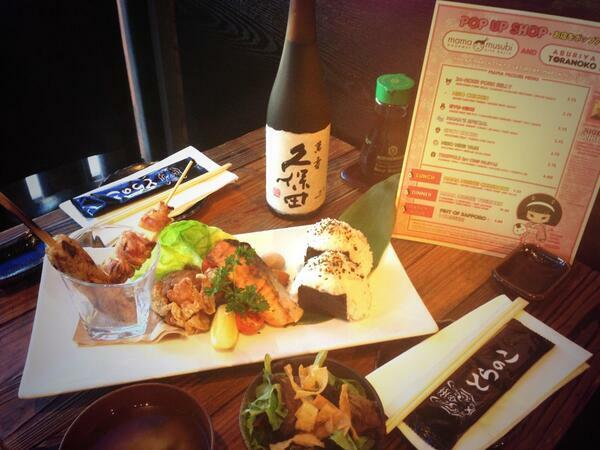 Considering each onigiri is $3.75 on its own, the lunch special is a no-brainer. You can even get it to go if you’re a harried office drone like me.